On Saturday, in a stunning example of the laughably low journalistic standards at the Daily Mail and the inability of some political dinosaurs to adapt to changes in the known environment, the paper re-ran it’s infamous story of the ‘£1.6 billion a year gravy train for employment lawyers’ derailed by ET fees. However, we don’t need Chapman to tell us how he got his £1.6 billion figure, because we know this from the original version of his article, penned by Steve Doughty and which appeared in the Daily Mail as long ago as 29 July 2014. That article – headlined “Hallelujah! The gravy train’s derailed” – informed us that “there were 191,000 employment claims in the financial year to March 2013 … with the average defence costing £8,500.” Multiply £8,500 by 191,000 and you get … £1.6 billion. In fact, it is Matthew Hancock and James Chapman who have failed both to learn the lessons from the debacle of the Daily Mail’s July 2014 article, and to absorb the factual evidence that has emerged from the Ministry of Injustice over the past eight months. Let’s leave aside the facts that employment tribunals haven’t been called industrial tribunals since 1998, and that employment tribunal cases are down by some 65 per cent, not “almost 80 per cent”, and focus on Chapman’s ignorant confusion of employment tribunal claims, and employment tribunal cases. For the BCC’s average cost figures of £8,500 for a business to defend itself at a tribunal hearing, and £5,400 to agree a settlement, are per employment tribunal case, not employment tribunal claim. And there have never been 191,000 – let alone 240,000 – employment tribunal cases a year; those figures are for the total number of claims, including both single claimants and all the claimants in the relatively small number of multiple claimant cases. 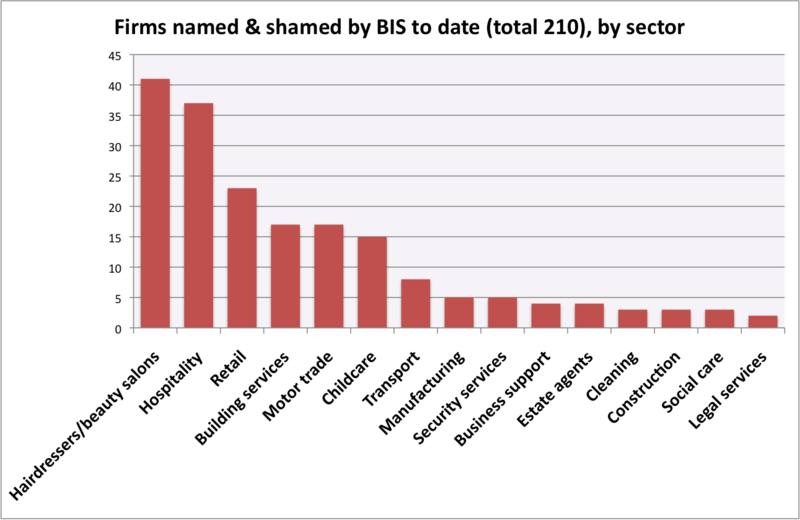 If the concern is the impact of ET claims on business, then it is the total number of cases (single claims/cases + multiple claimant cases) that is most meaningful, since that is also the number of employers affected. In 2012-13, the headline total of 191,541 claims used by Doughty to calculate his £1.6 billion figure consisted of 54,704 single claims/cases brought against 54,704 employers (or slightly fewer than that, in fact, as some claims would have been against the same employer), and a total of 136,837 multiple claimants in just 6,104 multiple claimant cases brought against 6,104 employers. So Doughty would have been a little more accurate if he had multiplied the BCC’s figure of £8,500 by 60,808, not 191,541. Furthermore, the £8,500 figure is wrong, firstly because it’s a considerable over-estimate (the government’s own figure is £6,200), and secondly because only about one in five cases go to a tribunal hearing. Most cases are settled or otherwise resolved before they reach a hearing, so the BCC’s lower figure of £5,400 applies (though, again, the government’s own figure for settlements is £3,500). Indeed, the government’s figure for the average cost to employers across all tribunal outcomes is just £3,900. So, all in all, Doughty’s bogus figure of £1.6 billion – mindlessly regurgitated eight months later by Chapman – is more like £366 million (£0.37 billion), if you accept the BCC’s dodgy average cost figures, and just £237 million (£0.24 billion) if you prefer the government’s more reliable average cost figure of £3,900. And, finally, only about two-thirds of that total cost to employers is borne by businesses, as one in three employment tribunal cases (including the vast majority of those pesky multiple claimant cases) are brought against employers in the public and voluntary sectors. In short, Doughty and Chapman overstate the ‘problem’ for their beloved private sector firms by a factor of 10. As for the dinosaur Hancock, his entire argument rests on the assumption that only weak or vexatious claims/cases have been deterred by the hefty, upfront fees. But if that were true, and only strong claims/cases were making it to the tribunals, the proportion of successful claims would have risen towards 100 per cent, and the proportion of unsuccessful claims would have dropped towards zero. And what we – but seemingly not the Minister – have learned since he first fed the ‘£1.6 billion gravy train’ story to the Daily Mail and Sunday Express in July 2014, is that the very opposite is happening. As the following chart (based on official figures) shows, the proportion of successful claims (the blue line) has gone sharply down, not up, and at just eight per cent in the most recent quarter for which the figures are available (July to September 2014) was less than half that in each of the six years before the introduction of fees. And the proportion of unsuccessful claims is markedly up, not down. Now, it might be said that the proportions shown in the above chart are not the full story, as four in five claims do not go to a hearing, and are either conciliated (i.e. settled) by Acas, or are withdrawn by the claimant. And, as Naomi Cunningham and Michael Reed have noted recently, “most of these withdrawals, but not all, represent some form of non-Acas settlement.” So, it might be said that the proportion that matters is the grand total of those claims that are successful at a hearing or result in a default judgment, plus those that are conciliated by Acas, and those that are withdrawn. However, as the following chart shows, that proportion has also gone down, not up. So, another Hancockusaurus and Daily Mail #Fail. Though you do have to admire their persistence. Last week’s publication by the Ministry of Injustice of the latest set of quarterly tribunal statistics, covering October to December 2014, was in many ways a damp squib that added little to what we already know about the impact of ET fees since July 2013. ET claim/case numbers continued to bobble along at about one-third the pre-fees level, and the claim outcome percentages – which might have enabled us to pour further scorn on the assertion of Matthew Hancock and others that only weak or vexatious claims have been deterred by the fees – were rendered meaningless by the striking out of one exceptionally large multiple claimant airline case involving some 243,000 claims. The only real cause for excitement – yes, I’m that sad – was the inclusion, for the first time, of figures on applications for and grants of fee remission (or ‘fee waivers’, as ministers have taken to calling it). From the four tables in Annex D, covering the five quarters up to September 2014, we learnt that 95 per cent of remission grants to single claimants have been for full remission, and only five per cent for partial remission. And we learnt that, while 48 per cent of the single claimants from whom the issue fee was requested applied for remission, only 21 per cent of those from whom a hearing fee was requested did so. With a bit of work, the figures also allow us to unpack – to some extent at least – the Ministry’s previous statement that gross annual fee income is running at about £12 million, of which some £3.2 million is “foregone in remission”. Because there is enough data spread over the four tables in Annex D to construct the following table for gross and net fee income from, and remission to, single claim/cases (but not multiple claimant cases, or EAT cases) over the 12-month period October 2013 to September 2014. From this, we can see that single claimants in the ETs contribute £8.8 million (73 per cent) of the Ministry’s gross income of £12 million, and £6.56 million (75 per cent) of the Ministry’s net income of £8.8 million. And they benefit from £2.23 million (70 per cent) of the £3.2 million foregone in fee remission. The other 25 per cent (£2.2 million) of the Ministry’s net fee income comes from claimants in multiple claimant cases, and appellants to the EAT. We can also see that, of that £8.8 million contribution to the Ministry’s gross fee income, £7.9 million (90 per cent) comes from claimants making Type B claims (e.g. discrimination, unfair dismissal). Similarly, of the total £2.23 million foregone in remission, all but £128,000 (5.7 per cent) is granted to those making Type B claims. And then there’s former shadow attorney general Emily Thornberry, who yesterday re-iterated (during her Westminster Hall debate on equal pay) her proposal that equal pay claims be exempted from ET fees for five years – the clear implication being that she would be happy for fees to continue for other claims. Sadly, working out what the three tweets above, and Emily Thornberry’s proposal, might tell us about the policy on ET fees of any future Labour government is beyond my tiny brain. So I’m going to bed. With my Legal Officer at the Free Representation Unit hat on I go to the meetings of the Employment Tribunal National User Group. From time to time I’ve written up some of my notes, on the basis that there was interesting information that could be usefully distributed further. This may become unnecessary, since HMCTS is making the minutes available. But, if only to draw attention to that, I thought at least one more post might be useful. Note, however, that these are my best notes of the meeting and shouldn’t be read as any formal statement by any of the tribunal judiciary or HMCTS (any errors are mine alone). I didn’t get a full note of some of the detail, so that will have to await minutes. This has been reduced, to reflect the fact that HMCTS expect fewer cases. It shouldn’t be regarded as a budget cut, because it’s based on the modelling of the case-load rather than trying to reduce costs. If there are more cases than expected there will be a case for more budget and that case will be made. MoJ is doing ongoing reform work, including within the Employment Tribunals, focused in particular on IT and premises. This will start to affect the ETs in the next 12 to 18 months. Likely to be some changes users will like and some we’ll dislike. Bristol and Nottingham have both recently moved into combined court premises. Initial feedback seems to be positive and HMCTS feels they’ve been able to maintain the informality of the tribunal while making efficient use of the premises estate. Huntingdon moved into the law courts a few years ago and has been the only user. Due to changes elsewhere the Crown Court will be moving back in, partially displacing the Employment Tribunal. There will therefore be sittings in Cambridge as well as Huntingdon. The guidance booklet Compensation for loss of pension rights: employment tribunals, third edition is currently marked on the Gov.uk website as withdrawn. People who follow me on twitter may have seen that I was curious about this and so I raised a question. The present position is as follows. Following the Court of Appeal judgment in Griffin v Plymouth Hospital NHS Trust the President of Employment Tribunals has formed a working group to consider whether there should be updated guidance. Any new guidance will be the subject of consultation. It may well take the form of Presidential Guidance, rather than a new booklet. There has been no formal withdrawal of the 3rd edition guidance. Parties must take their own view on the extent to which, in any individual case, it is appropriate to rely on that guidance in the light of Griffin v Plymouth and what, if any, other material should be presented. MoJ continues to work on the process for applying for remission. We can expect further changes in the Autumn. Slightly over 30 responses have been received. 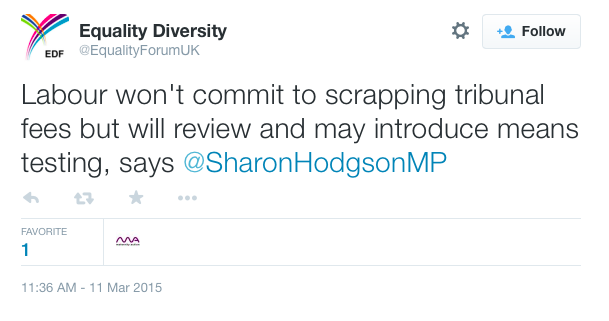 Given the timescales, the response is likely to be published after the election. “Can I just say that when we told MoJ employment tribunal fees were disproportionate compared to court fees, this wasn’t what we had in mind”. Pricing claimants out of the courts has severe implications for access to justice but my concern today is with a decision of the Employment Appeal Tribunal reported last week, L Goldwater & Others -v- Sellafield Ltd. This was a decision of HHJ Shanks on the papers about a cost application for the recovery of the £1,600 fees paid by the employees for the privilege of successfully correcting the error of an employment tribunal judge (where they may have paid a fee of at least £390), on a claim for shift allowances. It is not clear from the original judgment how much money was at stake, but there appear to be 16 claimants affected. The appeals were not wholly successful. This is described as false and “almost disingenuous” and any fair reading of the original judgment in November would be that the Appellants had won. There is no entitlement to an order. The judge has a wide discretion and it was “perfectly appropriate and reasonable” for the respondent to resist the appeal. These submissions were rejected on the basis the Appellants had to bring the appeal to correct the employment judge’s error. Incidentally, I always considered it unfair that the parties had to pay for the Employment Judge’s mistake and having to pay a fee only compounds matters. The fees were not paid by the Appellants but by their union, the GMB and so no award can be made under Rule 34A(2A). There was no dispute that the tribunal claims and appeals were supported by the Appellants trade union, the GMB, no doubt under the union’s legal advice scheme. Free legal advice is one of the main benefits of union membership. It is akin to legal expense insurance. Many unions extended their schemes to cover the cost of fees when they were introduced in July 2013. Just like legal expense insurance, all the schemes are subject to terms and conditions that vary, but may include continuing to pay union dues, meeting criteria as to the prospects of success, following advice from retained solicitors and payment of all costs and expenses if the member instructs new solicitors. Nearly all schemes reserve a residual discretion to the union as to whether to support or continual to support a claim. In Mardner -v- Gardner & another the HHJ Eady in EAT held that the fact that a party was insured was not a relevant factor to take into account when considering whether to award costs. There were public policy grounds for holding that a Respondent should not benefit from the prudence of the Appellant in taking out insurance. Incidentally, HHJ Eady exercises her discretion at the end of the decision to award the £1600 appeal fees to the Appellant. Although it is not clear from the judgment, it may well be a reasonable supposition to assume that the appeal was supported by legal expense insurance and the fee ultimately paid by the insurer. There is just a finding that the claimant had “incurred” the fee. HHJ Shanks refers to the difference in wording between “incurred by or on behalf of” in Rule 34(2) for the definition of costs and the limit on the “amount” of costs which can be made under Rule 34A(2A) to “…any fee paid by the appellant”. He finds that the Appellants paid no fees at all in this case and so the maximum order that could be made is nil. He therefore dismissed the application for fees to be paid whilst pointing out his decision is confined to Rule 34A(2A) and did not affect Rules 34A(1) and 34B-D about ordinary costs or expenses. The reaction on twitter was immediate and damning. The decision is wrong and leads to absurd results. “Paid by” must include “paid on behalf of” or “paid by union/insurer/etc”. More importantly, the wording of Rule 34A(2A) is replicated in the Employment Tribunals (Constitution and Rules of Procedure) Regulations, 2013 Rule 75(1)(b), Rule 76(4) and Rule 78(c) where there is reference to “tribunal fee paid by the receiving party”, “where a party has paid a Tribunal fee…” and “…a specified amount as reimbursement of all or part of a Tribunal fee paid by the receiving party”. I anticipate it will not be long before a similar argument is made in the tribunal to resist a claim for fees when a claim is lost. It will not just be union supported claims, but also legal expense insurance claims, No Win, No Fee lawyers or even solicitors who pay fees upfront in an emergency when a claim is going out of time before any retainer agreement is signed. Until the matter is resolved (I understand the Appellants are considering an appeal), advisers should ensure they can demonstrate that the party claiming the fee has “paid” it. Ironically, if the case reaches the Court of Appeal where an inflated court fee will be paid there will be little or no argument that the losing party has to pay the winning parties costs and disbursements, including any court fee (although see Unison -v- Kelly for an exception). Access to justice in employment cases just got even harder. Will the Minister talk us through the consequences to companies of not following the [NMW] regulations? If the number of prosecutions is so low, and those who are named and shamed can bear the brunt of not being popular, is there really any consequence of not paying all those low-paid workers? As I set out in my opening remarks, there are very heavy penalties [for non-compliance]. The hon. Lady may not ever have run a business, but I assure her that for people who do so, fines and reputational damage are a major force for compliance. Prosecutions may satisfy the politics of envy of the Opposition, but they are not the best mechanism to drive compliance. A crass remark, for sure, but one problem with Labour’s head office and MPs making such a loud and gleeful noise about it is that it invites us to ask what approach Labour would take to enforcement of the minimum wage should they find themselves in government on 8 May. For, crassness aside, the Minister makes a good point. The criminal prosecution of minimum wage rogues has never been a key element of the enforcement regime, with the Labour government that established the regime itself managing only seven prosecutions in the four years after criminal sanctions came into force in 2006. Indeed, that Labour government had deliberately created an enforcement regime based on HMRC securing compliance (and payment of arrears to workers) through investigation and the imposition of civil penalties, without resorting to resource-draining prosecutions in the criminal courts. So it is at least arguable that every prosecution represents a failure of the enforcement regime, as designed by Labour. In other words, the fewer prosecutions there are, the better. Certainly, the number of prosecutions is not a very helpful yardstick. What matters most is whether minimum wage-flouting employers believe there is a real risk they will be investigated by HMRC. And that depends upon the financial resources made available to HMRC for intelligence gathering, inspections, and investigations. In any case, the inescapable fact is that criminal prosecutions are at least 25 times more costly than a standard investigation by HMRC. According to official figures cited in the Trust for London report Settle for nothing less, a criminal prosecution costs at least £50,000, while the average HMRC investigation costs just £1,850. So, if prospective ministers such as Ms Creasy want there to be more criminal prosecutions from 7 May, they will either have to come up with (a lot) more money, or face presiding over a substantial cut in the number of HMRC investigations. To date, there has been no indication from any shadow minister that Labour would increase the spend on minimum wage enforcement – which the Coalition has recently increased by an impressive 50 per cent, from £8 million in 2013-14, to £9 million in 2014-15, and a budgeted £12 million for 2015-16. Indeed, Vince Cable and Jo Swinson have steadily shot most of Labour’s minimum wage enforcement foxes: naming & shaming is (finally) gearing up; the maximum civil penalty has been increased from £5,000 to £20,000; and, as I’ve noted previously on this blog, that maximum penalty will increase again to a more than adequate £20,000 per underpaid worker just as soon as the Small Business, Enterprise & Employment Bill becomes law. Poor Labour MPs are left waving little more than a meaningless pledge to ‘increase’ the maximum penalty to £50,000 (per employer or per worker, no one’s thought it necessary to spell out). 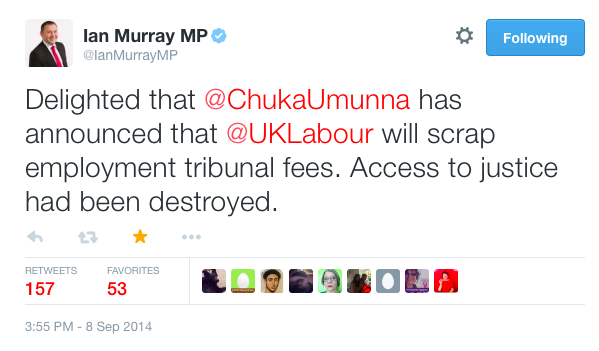 So, do Labour plan to reshape the enforcement regime, with a new emphasis on (expensive) criminal prosecutions? I put that question to Ms Creasy and Mr Doughty on Twitter, but they didn’t respond. I guess it’s easier to make fun of hapless government ministers than it is to explain what you’d do differently if you were sitting in their ministerial chair. Postscript: Ms Creasy appears to have read this post, but has not (yet) taken the opportunity to explain the extent to which criminal prosecutions would feature in a Labour government’s approach to enforcement of the minimum wage. With Labour shadow ministers and policy wonks seemingly too scared of their own shadows to find a place in their ‘better economic plan’ for their party’s employer-friendly policy pledge to at least substantially reduce the Coalition’s employment tribunal fees, now seems a good time to revisit my April 2014 attempt to set out a fiscally credible means of delivering on that pledge. Since April 2014, we’ve learnt a fair bit about the level of fee income to the Ministry of Injustice, and the operational cost savings to the Ministry resulting from the steep decline in claims/cases since July 2013. Fee income (net of fee remission) is running at £8.8 million per year, and gross annual expenditure on the employment tribunal system has fallen by £14.4 million, from £86.7 million in 2012/13 (the last financial year before fees), to £76.3 million in 2013/14 (when fees were in force for eight months of the financial year), and £72.3 million in 2014/15. So, assuming for one moment that outright abolition of the fees regime would return the number of claims/cases to pre-fees levels, such abolition now appears to carry a price tag of some £23.2 million per year (£8.8m + £14.4m). However, it’s very unlikely that outright abolition of the fees regime would return the number of claims/cases to 100% of its pre-fees level, for the simple reason that claim/case numbers had been in slow but steady decline for several years before the introduction of fees in July 2013, and that downward trend would most likely have continued had fees not been introduced. In other words, some – perhaps as much as 15 per cent – of that £14.4 million reduction in operational costs would have happened anyway. Furthermore, the figure of £14.4 includes efficiency savings made within the ET system unrelated to the impact of fees. So, as precision is not really available to us here, let’s just say that the actual price tag associated with outright abolition of the fees regime would be more like £20 million per year. Now, many will say that £20 million is a piddling sum, and in one sense they’re right: it’s just 0.3 per cent of the Ministry’s overall annual budget of £6.8 billion. But there’s ample evidence that any incoming Chancellor and Justice Secretary would take a different view. Money is going to be very tight under the government elected on 7 May (or, the government undemocratically constructed by political horse-trading in the days following 7 May). In any case, it’s pretty clear that Labour’s policy pledge on fees does not amount to outright abolition (and all that the Liberal Democrats have said so far is that they’d conduct a review). So, it’s more realistic to assume that fees will remain in some form, and to set ourselves the task of constructing an alternative fees regime that would restore access to justice, while covering at least some of that £20 million. To my mind, that implies no more than nominal fees for claimants. In April 2014, I suggested flat-rate issue and hearing fees of £50. And I argued that, with the advent of state-funded early conciliation of potential claims by Acas, there’s a perfectly sound case for employers having to pay similar fees to defend a claim that they have failed to resolve via Acas. If the number of single claims/cases rose to just 30,000 per year – almost double the current rate of 17,000 per year, but still well below the 54,700 in 2012-13 – such fees would generate £3 million per year in issue fees and, assuming 20 per cent of cases went to a hearing, a further £600,000 per year in hearing fees. Alternatively, if the number of single claims/cases rose to 40,000 per year – more than twice the current rate of 17,000 per year, but still 27 per cent down on 2012-13 – such nominal issue and hearing fees would generate a total income of £4.8 million per year from single claims/cases. In April 2014, I also suggested that each claimant in a multiple claimant case pay nominal, flat-rate but reduced issue and hearing fees of £25, and I see no good reason to resile from that view. If the number of such claimants increased to 60,000 per year – double the current rate of 28,000 per year, but still well below the 136,800 in 2012-13 – that would generate another £1.5 million per year in issue fees and, assuming (perhaps conservatively) that 50 per cent of such claims would go to a hearing, a further £750,000 in hearing fees. To that we can add £225,000 in issue and hearing fees (of £50 each) from the 3,000 defending employers, making some £2.5 million in total. Yes, that amounts to only £7.3 million at most (assuming 40,000 single claims/cases). But those figures are based on scenarios in which claim/case numbers would rise from their current low level, but still remain well below their pre-fees level. In which case, the price tag associated with such a modest fees regime would be much less than the £20 million cited above. And, in the event that claim/case numbers rose to just below their 2012-13 level (say, 50,000 single claims, and 100,000 multiple claims in 5,000 multiple claimant cases), my nominal fees regime would then generate a total fee income of £10.1 million per year (which, you may remember, is what Ministry officials said in 2012 would have to be raised by any alternative regime to their own). Of course, that would still leaves us £9.9 million short on our £20 million. But the final element of my April 2014 proposal was a ‘polluter pays’ penalty for those employers found by a tribunal to have breached the law – that is, those employers that create the need for an employment tribunal system. Each year, about 12 per cent of all claims are successful at a hearing or result in a default judgement in favour of the claimant. And, if claim/case numbers rose to just below their 2012-13 level, as described in the previous paragraph, there would be about 6,500 losing employers. Imposing a penalty of £1,000 on each of those losing employers – a hefty sum, for sure, but still less than the £1,200 some claimants have to pay in fees now – would generate an income of £6.5 million. But your name is Sadiq Khan or Ed Balls, and you’re still fretting about another £3.4 million. So increase my ‘polluter pays’ penalty to £1,500. Why shouldn’t employers found by a tribunal to have acted unlawfully make such a contribution to the overall cost of the tribunal system? They would have had ample opportunity to settle the claim by that stage, including through early conciliation by Acas. There are, of course, any number of ways in which my proposed nominal fees (plus ‘polluter pays’ penalty) regime could be tweaked, but the essential point is that it is entirely feasible to construct a regime based on very low level claimant fees that would nevertheless cover most if not all of the increase in operational costs associated with the inevitable increase in claim/case numbers.